The Football Association of Zambia (Faz) has announced it will not renew coach Sven Vandenbroeck's contract when it expires next month. The Belgian was hired on a short-term deal last year after the resignation of Wedson Nyirenda. He was tasked with ensuring the Chipolopolo qualified for this year's Africa Cup of Nations, but failed to do so. The 39-year-old has just one win from four games in charge, drawing one and losing two - a sequence of results that leaves the 2012 African champions bottom of Group K of Nations Cup qualifying. Faz general secretary Adrian Kashala confirmed Vandenbroeck's last match in charge will be the final Nations Cup qualifier at home to Namibia next month. Assistant coach Chintu Kampamba has also left his role, with two fellow Zambians, Aggrey Chiyangi and Numba Mumamba, brought in as immediate replacements. "The non-renewal of Vandenbroeck's contract and the appointment of Chiyangi and Mumamba to the national team technical bench follows a meeting held by the Faz executive committee this weekend," Kashala added in a statement. "As an association, we continue to pursue the enhancement of football development by recognising and promoting young talent and building football administration across the country. "We expect nothing but a resounding win over Namibia." 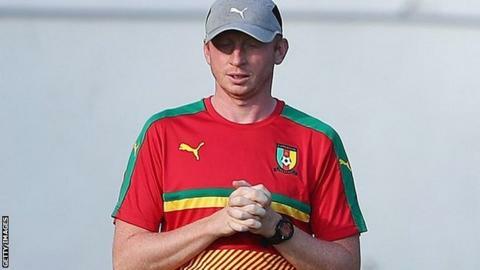 Vandenbroeck previously worked as an assistant to compatriot Hugo Broos as Cameroon won their fifth African title in 2017. Zambia's failure to qualify means they have now missed out on two successive Nations Cup finals. The Chipolopolo shocked the continent when winning the 2012 tournament.